Leimert Park, a 1.2 square mile neighborhood of Los Angeles, is nestled at the base of Baldwin Hills, a short distance from Culver City. Named for its developer, Walter Leimert, it was designed in the 1920s by the influential landscape architects, the Olmsted Brothers. Known for its Spanish Colonial Revival homes and its charming tree-lined streets, it evolved to become an important center of African American art, music, and culture in Los Angeles. 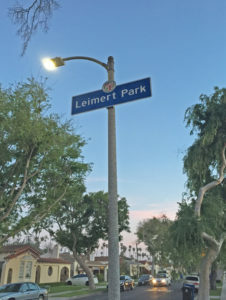 Additionally, many Japanese residents settled in Leimert Park after WWII, as is reflected in the unique Japanese gardens and Japanese-influenced architecture.